Managers and executives are always interested in current company data and KPIs (“key performance indicators”). This includes information about the current monthly and annual turnover. But also promising customer requests (A leads) that may require the collaboration of several departments. And of course also critical technical incidents at customers who need a quick solution to ensure customer satisfaction. Ideally, this information is available quickly and anywhere. If you use Microsoft Dynamics 365 CRM, SIGNL4 provides a powerful solution for proactive business notifications, set up in just a few minutes. SIGNL4 ensures fast mobile notification to team leaders and managers, taking into account their availability. All this works through Microsoft Logic Apps and the connector for SIGNL4, which requires an account with the SIGNL4 service. You can quickly set up an account in SIGNL4 through the mobile app. Of course you also need a Dynamics 365 subscription from Microsoft (the whole set up of course also works with other CRM vendors). To work with Logic Apps, you need an Azure account. Logic Apps are the “glue” between Dynamics 365 and SIGNL4. Open the Microsoft Azure Management Portal and go to “Logic Apps”in the menu. Click “New” to create a new Logic App. Enter the necessary data and wait briefly until the Logic App is created. Select a “Blank Logic App” as template. SIGNL4 templates will be available soon. Locate the “Dynamics 365” connector and select “When a Record is created”. Then select your Dynamics 365 organization and the entity to be notified. In the second step, search for “SIGNL4” and select the action “Trigger Alert”. You must then log in to the SIGNL4 portal with your SIGNL4 account in order to give Microsoft Logics Apps access to the necessary data (“Consent”). Here is a short video of how it works. Voilà. 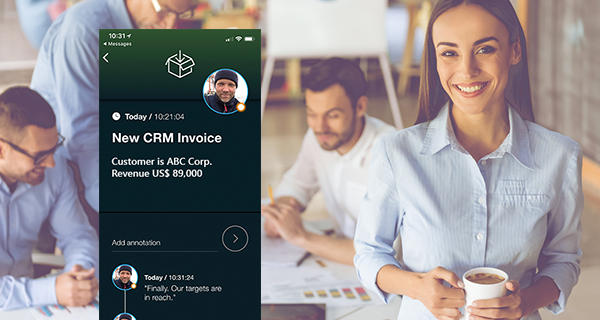 As soon as a new invoice is created in CRM, your team receives a mobile push notification via SIGNL4 with all specified data from Dynamics 365. You can test SIGNL4 for 30 days free of charge at any time. Click here for the mobile apps.